If the thunder of hooves and the thrill of the racing doesn’t grab you, the sublime settings surely will. From the grounds of a 16th-century chateau, to beaches, snow-covered lakes, glorious greensward and a track squeezed among skyscrapers, the sport of kings offers some spectacular venues for racegoers to savor. Here is a look at some of the most beautiful horse racing locations in the world. Spectacular and timeless, Chantilly racecourse nestles in front of the fairytale 16th-century Chateau de Chantilly amid a tree-lined tract 30 miles north of Paris. is a cathedral to 21st-century racing. The grandstand alone is more than a mile long and can host 60,000 spectators. What’s more, there is a rooftop infinity pool. 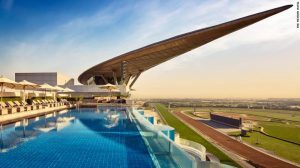 Since it replaced the Nad Al Sheba racecourse in 2010, Meydan has been home to one of the richest horse races in the world — the Grade 1 Dubai World Cup.